Our range of products include soyabean extraction plant. There are 3 different types of Soyabeans viz. brown, yellow and black with 18 - 22% content of oil. These Soyabeans are firstly cleansed, graded and then finally fed into the cracker, where these are cracked into small pieces.About 85 percent of the world’s soybeans are processed, or "crushed," annually into soybean meal and oil. Approximately 98 percent of the soybean meal that is crushed is further processed into animal feed with the balance used to make soy flour and proteins. Of the oil fraction, 95 percent is consumed as edible oil; the rest is used for industrial products such as fatty acids, soaps and biodiesel.entire oil is extracted after preparation of the seeds in the solvent and Soyabean Extraction Plant. Preparation of soya bean seeds includes seed cleaning, destoning, cracking, husk separation (if required), cooking, flaking, expanding and drying. The prepared expanded soya flakes are sent for solvent extraction. 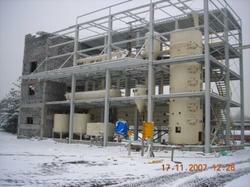 Solvent extraction is carried out in the normal fashion. The plants are ergonomically designed and are energy efficient, consistent in output quantity and quality, operator friendly and generate less effluent. The level of plant automation depends upon client requirement. These plants are more efficient than the traditional hydraulic press, ghani or continuous screw. Looking for Soyabean Extraction Plant ?